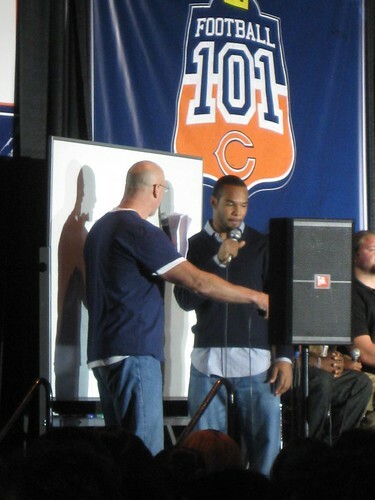 Two Chicago Bears who are invested in the Chicago running community? And the opportunity to meet them in the same week? I'm more of a fair-weather Bears fan (I've never been to Soldier Field for a football game but I've been there countless times for running events), but even I know this is too good to be true. It's just too bad the weather can't seem to cooperate and throw us a bone with warmer temperatures and less of a wintry mix on the ground. Or as Charles Tillman said on Saturday at his inaugural Peanut Tillman 5K, "It's Bears weather!" One look outside your window--or one step outside--and you know that spring is far from springing. It's snowy, it's cloudy, it's cold. Daylight savings may have ended over the weekend, but the weather is frightful more than it is delightful. We're still running in our winter layers and Yaktrax--or abandoning the outdoors for the treadmill. But whether our running bodies like it or not, the Bank of America Shamrock Shuffle, the Chicago race that kicks off the unofficial start to the city's running season, is a little more than two weeks away on Sunday, March 30. Hard to believe the running season will be starting soon when winter seems so never-ending. Who doesn't need a little shove out the door when running conditions are far from ideal? Nike Running Bucktown has some of that running motivation...especially tonight. The store's Run Club, which meets every Thursday at 6:30 p.m. at 1640 N. Damen, will host Matt Forte, a running back for the Chicago Bears, and Carey Pinkowski, executive race director for the Bank of America Shamrock Shuffle and Bank of America Chicago Marathon. After runners return to the store, Forte will host a short Q&A and share an overview of his foundation and the charity team that he's recruiting for the upcoming Shamrock Shuffle. At this year's Shamrock Shuffle, Forte will be hosting A Run For Our Future!, which will be a race inside a race. This is the inaugural event for The Matt Forte Foundation and proceeds will benefit Bears Care to assist Forte's recently established foundation in providing resources to Chicago high school students. The A Run For Our Future! team will be comprised of runners who are registered for the 40,000-participant race and have elected to join the team. A Run For Our Future! teammates will support Forte's efforts to encourage students to pursue their dreams of a higher education. But to learn more, you'll have to run with Nike and let Forte explain it. For Run Club: Meet at Nike Running Bucktown, 1640 N. Damen, at 6:30 p.m. Distances vary. Photo grabbed from BluEyedA73 at flickr.